We talk you through the latest interior trends for children’s nurseries, with a focus on important safety features and performance fabrics. Our curtains with blackout linings are both practical and stylish. The special lining helps prevent natural light coming in through windows, keeping rooms darker and cooler. This makes blackout curtains perfect for bedrooms, as the lining minimises early morning sun. They’re particularly helpful in children’s bedrooms, keeping them snoozing for longer in the morning. 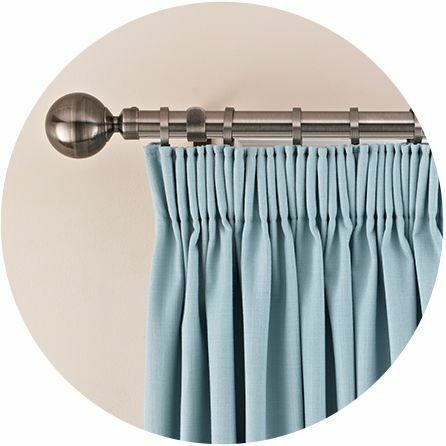 You can add blackout linings to almost any of our curtains, giving you hundreds of styles to choose from. Take your pick from classic plains or fashion-forward prints including geometric, floral and striped designs. Customise your blackout curtains with a range of gorgeous accessories and finishes. Choose a header style such as eyelets, pencil pleat or pinch pleat, and add curtain poles and tie backs to finish off your new look. 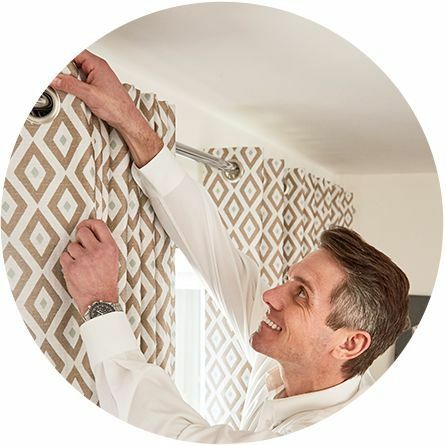 Our dedicated in-home service means that we take care of everything from start to finish. Simply book an appointment with one of our expert advisors, and we’ll come to you with our entire range of samples for you to browse at home. Our years’ of experience means we can talk you through the options that best suit your space, and help you choose fabrics, colours, and designs. Once you’ve decided which blackout curtains you’d like, we’ll measure up for you. All of our curtains are made-to-measure for a high-quality finish. We’ll also take care of fitting your new curtains when they’re ready, so you don’t need to worry about a thing.